Li An. Meeting Grand Challenges in Complex Systems through ABM Software Development. Luc Anselin. Spatial Data Science in a CyberGIS Era, GeoDa-Web. Giuseppe Amatulli. Geo-Computation of Big Data using Open Source Geo-Software: what we can do and the importance of mastering programming language at the graduate level. Gabriel Bowen, Hannah Vander Zanden, Michael Wunder and Lan Zhao. Geospatial software for animal movement applications. Guofeng Cao. Uncertainty Modeling in Geospatial Data Science. Jeffrey Carver. Software Engineering for (Open) Geospatial Software. Aashish Chaudhary. Enabling data intensive cloud computing for geosciences using flexible workflows. Yao-Yi Chiang and Dan Feldman. Next Generation Framework for Imagery Recognition and Analysis. Coline Dony and Douglas Richardson. Position paper on computer science literacy and diversity of the geospatial community. Michael Goodchild. Vision of a GSI and Geospatial Software in the next decade. Gillian Galford, Hermann Rodrigues and Britaldo Soarea-Filho. Pushing the envelope of spatial modeling with Dinamica EGO. The HDF Group. The Hierarchical Data Format as a Foundation for Community Data Sharing. Jong Lee and Daniel Katz. Open Source Community for Scientific Software: Considerations and Challenges. Xingong Li. Spatiotemporal Map Algebra–a Framework for Big Geospatial Data Analysis. Helena Mitasova, Ross Meentemeyer and Vaclav Petras. Open​ ​Source​ ​Geospatial​ ​Software​ ​and​ ​the​ ​Future​ ​of​ ​Geospatial​ ​Science. Robert Nagler and David Bruhwiler. The Replication Tax: Shifting the Financial Burden to Incentivize Reproducibility in Computational Research. George Percivall. GSI/GIC Science and Technology Tracking: Big Geospatial Data Analytics Roadmap. Martin Raubal. Tackling Mobility Challenges with Geospatial Software. Sergio Rey and Amr Magdy. Open Source Geospatial Software: Challenges and Opportunities. Erin Robinson. Community Recommendations for Sustainable Scientific Software. Hanan Samet. 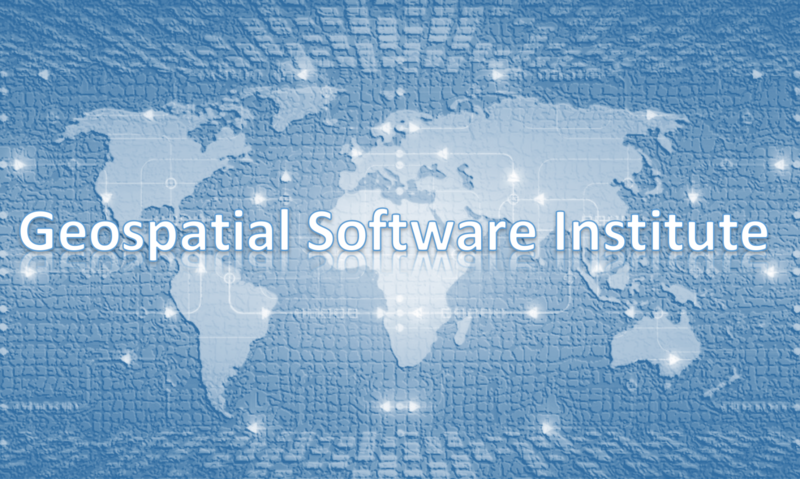 Interoperable Geospatial Software. Diana Sinton. Evolving Needs for Communication & Education for Success with a Geospatial Software Infrastructure. Shashi Shekhar, Emre Eftelioglu and Yiqun Xie. Transdisciplinary Foundations of Geospatial Data Science. Mary Shelley and Benoit Parmentier. Geospatial Computing Challenges in Socio-Environmental Research. Carol Song, Rajesh Kalyanam and Lan Zhao. Envisioning an Open, Collaborative and Seamless Geospatial Software Ecosystem. Eric Shook. Back to Basics: Rethinking Geospatial Software Fundamentals in a Cyber World. Tyson Swetnam. Cyberinfrastructure for scientific reproducibility in data-intensive geospatial research and education. David Tarboton. Geospatial Software Institute and Cyberinfrastructure for the Hydrology Community. Ming-Hsiang Tsou, Atsushi Nara, Arash Jahangiri and Sahar Ghanipoor Machiani. Developing Web-based Spatiotemporal Analytics Software Tools for Analyzing Connected Vehicle Data and Aggressive Driving Behaviors. Nancy Wilkins-Diehr. Experiences building the Science Gateways Community Institute. Dawn Wright and Steve Kopp. Esri Perspective on Envisioning a Geospatial Software Institute. Ryan Wyatt. Increasing Accessibility to Geospatial Visualization in Support of Research and Education. Li Xiong, Cyrus Shahabi, Liyue Fan and Ming Li. A Geospatial Software to Protect the Privacy of Location Data. Download all position papers as a zip file.